The sports world at large has been fascinated with Tom Brady’s determination to micromanage and obsess over every detail of his life, from his rest, recovery, muscle pliability, brain function, and most of all, diet. 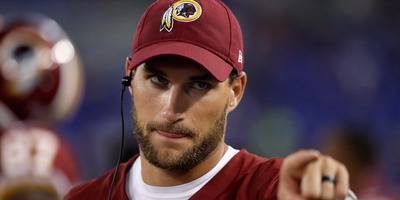 However, for all of Brady’s obsessiveness, he may be beaten out by the Washington Redskins quarterback Kirk Cousins. According to Sports Illustrated’s Greg Bishop, Cousins follows a similar model as Brady, tracking and detailing every aspect of his life, but he may even outdo Brady. According to Bishop, during the week, Cousins consults with his brain coach to track the electrical activity in his brain. This is just one specialist in Cousins’ team, which includes, according to Bishop, a fitness guru, physical therapist, naturopath, kinesiologist, biochemist, and several mentors, one of whom is a former FORTUNE 500 CEO. According to Bishop, to try and improve Cousins’ ability to manage the electrical activity in his brain, he used a computer program over the summer that played movies and slowed them down or shrank the screen when he showed too much brain activity. He watched all seven “Star Wars” films. Cousins likes to wake up early and make to-do lists that he calls “action plans.” He’s obsessively detailed, pinning pictures of reporters to the wall in his office so he can remember their names. He keeps a stack of folders dating back to 2010 of notes for each game. According to Bishop, the day after Cousins’ wife went into labour with their first child, Cousins FaceTimed from the delivery room into the team’s quarterback meeting, despite being excused from practice the day before. All of it is paying off, however, as Cousins is in line to be handsomely paid this offseason. Like Brady, Cousins was underestimated for most of his career, an average to below-average athlete whose skills weren’t as highly valued as some of his peers. However, though obsessive study of the game and preparation, Cousins has cultivated himself into one of the better quarterbacks in the NFL. This offseason, the Redskins have a few options: give Cousins a franchise tag worth about $US34 million or wait until another team offers him a similarly giant contract and weigh whether to match it. So while Cousins’ “process” doesn’t seem very fun, it appears to be working.